Fort Delaware is a harbor defense facility, designed by chief engineer Joseph Gilbert Totten and located on Pea Patch Island in the Delaware River. 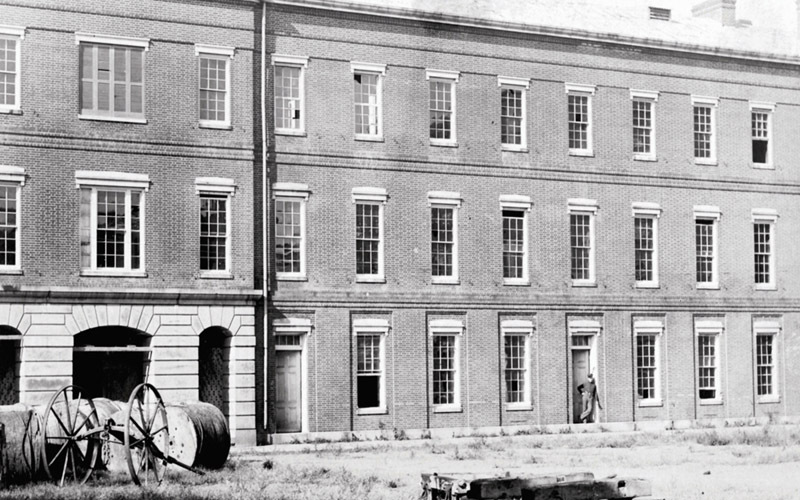 During the American Civil War, the Union used Fort Delaware as a prison for Confederate prisoners of war, political prisoners, federal convicts, and privateer officers. A three-gun concrete battery, later named Battery Torbert, was built inside the fort in the 1890s and designed by Maj. Charles W. Raymond. By 1900, the fort was part of the three fort concept, working closely with Fort Mott in Pennsville, N.J. and Fort DuPont in Delaware City, D.E. The fort and the island currently belong to the Delaware Department of Natural Resources and Environmental Control (DNREC) and encompasses a living history museum, located in Fort Delaware State Park.